Scott Fox, Free Radio Publicity & Podcast Interviews Expert - Radio Guest List.com - How to Get Radio Interviews and Find Podcast Guests! How can you promote your book, product, service, or cause FREE on the radio? Would you like to be interviewed on popular podcasts and radio shows? Scott Fox can teach you how! Scott Fox is a serial entrepreneur, best-selling author, and the Founder of the #1 free radio and podcast publicity service, RadioGuestList.com. If you or your listeners are interested in cost-effective marketing and public relations strategies, Scott can help. He's helped 10,000+ authors, celebrities, experts, and marketers of all kinds get booked for free "Guest Expert" appearances on podcasts and radio shows worldwide. 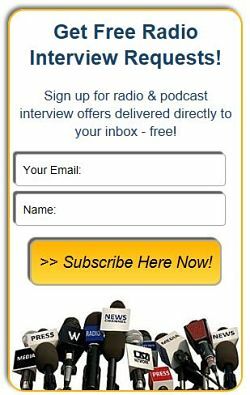 There are podcasts and radio shows worldwide who are looking for guest experts to interview. Interview Scott to learn how you can benefit from this unique Public Relations strategy. Founder of RadioGuestList.com, the #1 podcast and radio guest booking service. Author of the new Podcasts & Radio Shows Directory, a #1 Amazon.com Best-seller in both Podcasting and Public Relations. Author of 3 best-selling books about startups, entrepreneurship, and social media marketing. Host of the "How to Be an Entrepreneur" MasterMinds podcast since 2008. Tweeting, Facebook, and helping you get more guests using our free RadioGuestList.com booking service!